Do your grocery bags need a better look? 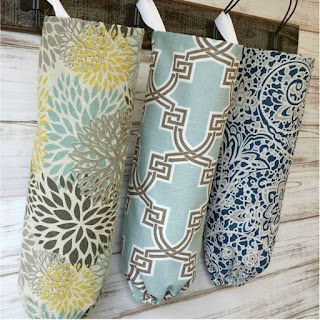 Right now these Grocery Bag Dispensers are $10.95 (Retail $19.95). Organizing after the holidays just got easier! And what a perfect gift for that hard-to-buy-for friend! Easily hang dispenser from a doorknob, hook or kitchen pull from the sewn-in white twill ribbon loop. Select from over 40 gorgeous designer fabrics. Some fabrics may have a slubbed texture.